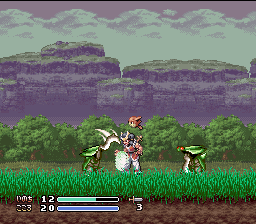 Bushi Seiryuuden: Futari no Yuusha (“Warriors of the Blue Dragon Legend – The Two Heroes”) is a rather unique action/tactical RPG hybrid. It was developed by Game Freak and published by T&E Soft in 1997, as one of the last titles released on the system. Game Freak should, of course, be known to every gamer out there, since they developed Pokémon for Nintendo. 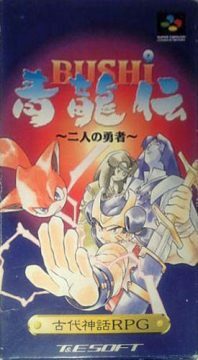 Bushi Seiryuuden shares a similar artwork style, but this is the only similarity to the well known series. The story takes place in a fantasy version of medieval Japan. In the beginning, you take on the role of a young hero, named of your choosing, who is a young swordman in training. His sister Nami is kidnapped by the monsters of the Ocean God while he is on an expedition, so he decides to take revenge and save her. He is joined by Wokuu (who can also be renamed), a little floating beast who appears to be a transformed girl – she joins the hero in order to find a way to revert to her true form. Later you also come across Miko, another beast like Wokuu who was once human. She acts as a sage and guard the island of Mikajim, which acts as the central hub to the numerous sub-worlds. 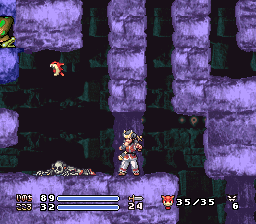 Bushi Seiryuuden utilizes numerous perspectives, which is largely what makes it so unique. 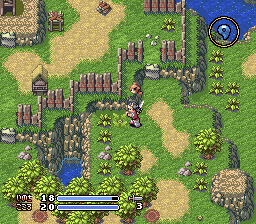 During exploration, the perspective looks similar to the average Legend of Zelda-style overhead RPG. You visit towns, cut grass, pick up treasures and search for new dungeons. Whenever you talk to somehow, it changes to a first person perspective, and even lets you look around the immediate area. However, whenever you get into a battle or enter a dungeon, the game switches to a side-view perspective. It looks like an action game, but it’s actually entirely turn-based, as you can move one space or attack every turn, while the enemies take their turns in conjunction with yours. These sequences forego the standard command menu, and you control the hero directly with the d-pad and the buttons. Enemies are visible on the overhead field, and you can either attack them to gain an advantage or be ambushed so the enemies get first strike. If your level is high enough, you can take them out on the map without even going into combat. At any given time, there are two characters in your party, but you control them like they were one. The Hero wields a sword and has a number of sword techniques at his disposal, as well as a magical shield. The shield can defend from a single enemy attack, and can fired a bullet a small distance, although it only does half the damage of standard attack and also drains your “kokoro” (“spirit”) meter. Wokuu, acting as his partner, can lift him into the air (although only for a limited number of spaces), destroy low-tier enemies out of reach, and essentially distract enemies from attacking the main character. However, she also has her own life meter, and if she runs out hit points, she’ll be knocked out of commission for a set number of turns or under the battle ends. Of course, you gain new abilities throughout the game that let you do a number of different attacks. Many of these allow you to attack multiple enemies at once, or including all enemies in horizontal rows, vertical columns or 3×3 squares. You also have an ability called the “Heart Eye”, which will examine the strength of all enemies in the area, as well as indicating hidden stuff. One of the main quests is to destroy the tower of the ocean god. In order to do so, you need to collect Magatamas, which look like one half of a yin-yang symbol. Before each battle, a number is flashed on the screen, which indicates a turn limit – if you can defeat all of the enemies within this span, you will collect more Magatama, giving you an incentive to be clever. 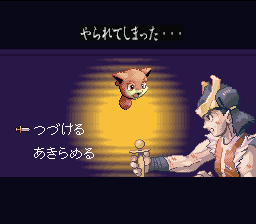 Throughout the game there is also a running subquest to obtain Tear Drops, which expand your maximum spirit meter. Graphically, the game is pretty decent, with detailed sprites, nice parallax scrolling in the side-scrolling segments and some nice visual trickery, like the Mode 7 effects to emulate flowing waves. However, the sound is generally too simple and not all that memorable. It’s not quite as flashy as some other Super Famicom RPGs, and the plot is fairly typical, but the innovative battle system sets it apart from practically every title released before or after it. It’s enough to make you annoyed that Pokémon‘s success has doomed Game Freak to an eternity to working solely on Nintendo’s battling monsters, depriving the world of more unique titles. Alas, it came out too late in the system’s life for anyone to bother translating it, so it was never released outside of Japan. There is currently no fan translation, but the language barrier isn’t hard to overcome.